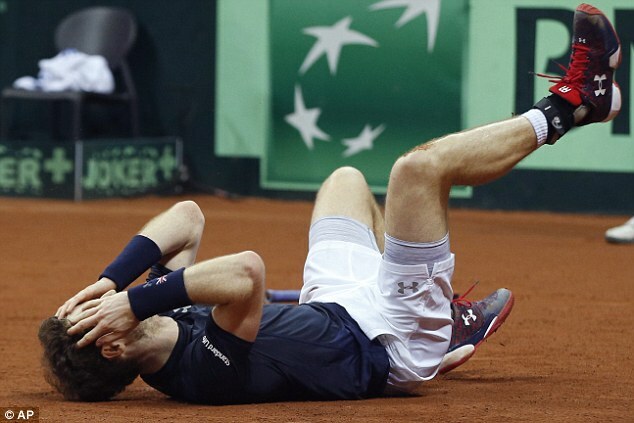 Andy Murray helps UK win Davis Cup after 79 years !! Kyle Edmund became the first player to make his Davis Cup by BNP Paribas debut in a Final since 2003 after being given the nod by Great Britain captain Leon Smith to take to the court on the opening day against Belgium. 12 years ago, Spain’s Feliciano Lopez experienced his first taste of Davis Cup in the final. India competed its first Davis Cup in 1921 but has not won yet. We finished as runners-up 3 times (1966, 1974, 1987). In 1974, the final was scratched and South Africa were awarded the Davis Cup after India refused to participate in the final due to the South African government's apartheid policies. India were strong favorites to win with Vijay Amritraj and Anand Amritraj at their best. Remember in 1987, India again reached the finals but this time it was a very strong Sweden line up as they played at the Scandinavium in Gothenburg, Sweden. Mats Wilander beat Ramesh Krishnan; Andres Jarryd beat Vijay Amritraj; Joakim Nystrom/Wilander beat Anand & Vijay Amritraj; Andres Jarryd beat Ramesh Krishnan and Wilander beat Vijay. Davis Cup began in 1900 as a competition between USA and Great Britain and went on to become the world’s largest annual international team competition in sport, with 126 nations taking part in 2015. In the inaugural version USA played the British Isles. It was held at the Longwood Cricket Club in Boston and the Americans surprised their opponents by racing into an unassailable 3-0 lead. Once the two respective national associations had agreed, one of the four players, Dwight Davis, designed a tournament format and ordered a trophy, buying it with his own money. The tournament was originally known as the International Lawn Tennis Challenge, later became known as Davis Cup after Dwight Davis’s trophy. In 2000, Spain won its first Davis Cup title before going on to claim four more victories and establish itself as the competition’s dominant force of recent times. During the last decade, Russia, Croatia, and Serbia also lifted the trophy for the first time, with the latter two being the only unseeded nations to win the title. In the 100th Final in 2012, Czech Republic overcame Spain 3-2 in a dramatic contest. BNP Paribas took over NEC as the competition’s Title Sponsor in 2002, a partnership that still flourishes today. The news now is Andy Murray has given Britain its first Davis Cup title in 79 years after beating Belgium's David Goffin. The British number one had his pregnant wife Kim and mother Judy cheering him on as he sailed past his opponent 6-3, 7-5, 6-3 in Gent. The win gave Britain an unassailable 3-1 lead in the best-of-five series and the final singles match was not played. Murray was forced to play some of his best tennis against an opponent who refused to buckle, but he would not be denied. He wobbled briefly when he dropped serve early in the third set but the world number two responded to move 5-3 ahead. He finished the job in spectacular fashion, hoisting a lob over the stranded Goffin before collapsing on to the court. Murray was immediately swamped by his team mates, captain Leon Smith and the support staff and was hoisted shoulder high on the court before saluting the dancing British fans. Britain is the only nation to have competed in all Davis Cup editions since 1900 and its 10th title makes it the third most successful nation after the United States (32) and Australia (28). But it was a long way coming. Britain last won it in 1936 with Fred Perry as its star and last played in the final in 1978. In July 1983, Lendl played three exhibition matches (against Johan Kriek, Kevin Curren, Jimmy Connors) in Sun City, in the apartheid-era. The Czechoslovak Sport Federation (ČSTV), controlled by the Communist Party, expelled him from the Czechoslovak Davis Cup team and fined him $150,000. Lendl disagreed with the punishment and fine. In addition, the publication of his name and results in the Czechoslovak media was prohibited. The ban was extended not only to Lendl, but to anything about world tennis. This resulted in his decision to apply for a green card in 1987 and later on for U.S. citizenship. The meeting, on September 29, of External Affairs Minister Sushma Swaraj, US Secretary of State John Kerry, and Japan’s Minister for Foreign Affairs Fumio Kishida in New York was hailed as the first trilateral meeting at the foreign ministerial level between New Delhi, Washington and Tokyo. In his opening remarks, Kerry spoke of East Asia as “a place of challenge for some issues of security”, Swaraj spoke of the “sea lanes of communication in the region” as “the lifeline of India’s trade and commercial externalities”, and Kishida described the Pacific and Indian Oceans as “oceans of freedom and prosperity”. Back home, the Bay of Bengal- along the eastern seaboard- is important to India in the light of its Look East Policy, which has been tweaked by PM Modi as the Act East Policy. In 2007, China protested against the Japanese participation in Malabar 2007. This was followed by the then UPA government limiting the exercise to just a bilateral one between India and US. The JMSDF participation in the exercise in Bay of Bengal is thus a significant diplomatic decision for India for two reasons. On one hand, it underlines the importance Delhi imparts to ASEAN. On the other, it sends out a strong signal to China that India will independently pursue its foreign policy not withstanding interference from any other power. The six-day Malabar 2015 exercise that concluded in the Bay of Bengal on Monday needs to be viewed in the light of these stated positions, which have been articulated by each of the participating nations for long now. 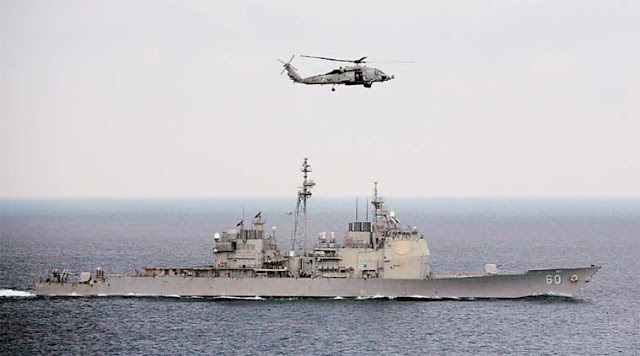 Malabar, initially an India-US bilateral naval exercise, began in 1992, and Japan became a permanent participant only in the current — 19th — edition in 2015. Japan’s participation as a non-permanent participant in 2007 had drawn a strong protest from China; Japan, nonetheless, participated in the 2009, 2011 and 2014 editions of the exercise, which were held off the Japanese coast. The participation of Japan, which deployed missile destroyer J S Fuyuzuki and SH 60K helicopters on India’s invitation, is the first time since 2007 that the Japanese Navy has participated in the exercise being held off the coast of India. It also signals the importance that the government and Prime Minister Narendra Modi personally have attached to strategic ties with Japan. In the Malabar 2015, the Indian Navy has been represented by INS Shivalik -an indigenous frigate, INS Ranvijay – a guided missile destroyer, INS Betwa- an indigenous frigate and INS Shakti- a Fleet Support Ship. In addition, one Sindhugosh class submarine, INS Sindhudhvaj, Long Range Maritime Patrol Aircraft P8I and integral rotary wing helicopters also participated in the trilateral exercise. The US Navy was represented by the ships from Carrier Task Force (CTF) 70 of the US Navy’s 7th Fleet, which is based at Yokosuka, Japan. The CTF included the Nimitz class aircraft carrier USS Theodore Roosevelt, Ticonderoga class Cruiser USS Normandy and Freedom Class Littoral Combat ship USS Forth Worth. In addition, one Los Angeles class nuclear powered submarine USS City of Corpus Christi, F18 Aircraft from US Carrier Air Wing and P8A Long Range Maritime Patrol Aircraft have been a part of the exercise.The JMSDF was represented by JS Fuyuzuki, a missile destroyer with SH 60K integral helicopter. ~ and besides the participation of Japan, there is more to cheer about as reported in Daily Mail. If the hostile entry of the U.S. Navy’s 7th fleet in the crucial stage of the 1971 war for the liberation of Bangladesh sent a shiver down the spine of Indian military commanders, events at the Malabar 2015 in October gave the latter some relief. An operation under the high-profile naval exercise Malabar, between the navies of India, the U.S. and Japan, featured a simulated battle to hunt and destroy each other’s submarines. Locked in this battle were two prowlers, the INS Sindhudhvaj (S56), a Soviet-designed EKM class of conventional submarine, and the USS City of Corpus Christi (SSN705), a nuclear-powered attack submarine that functions like a fighter plane — scrambles and destroys enemy submarines and ships. Crew of both the vessels was asked to hunt the other down in a general area of the Bay of Bengal, based on the ‘available Intel’. Hours later, as they still searched, the Americans were informed that the game was over already. Unknown, they had been marked, tailed and suitably ‘annihilated’ by the 533mm torpedoes ‘fired’ by their Indian counterpart from on board the INS Sindhudhvaj. What came as a clincher to the Indian side was the tool which detected the USS Corpus Christi — the ‘Made in India’ Ushus SONAR (Sound Navigation and Ranging) which was recently installed. “The way it happened is that the Sindhudhvaj recorded the Hydrophonic Effect (HE) — simply put, underwater noise — of the N-powered submarine and managed to positively identify it before locking on to it. India has nine such submarines besides four German-designed Shishumar class ones. News source : The Indian Express & Daily Mail. India won at Nagpur and thereby won the Series ~ SA have paled in colour with ordinary performances in all the innings. Miles away, the 3rd Test of Trans-Tasman Trophy played between 27th Nov to 1st Dec 2015 at Adelaide Oval is the most talked about ! – because of its novelty. 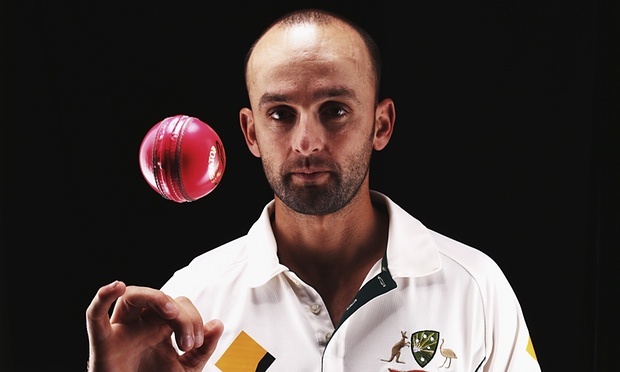 Prior to the match, Nathan Lyon fuelled speculation that Australia may field two spinners stating that he expects the pink ball to give him and his fellow tweakers an advantage. New South Wales spinner Steve O’Keefe had been added to Australia’s 13-man squad and there were reports of Coach Darren Lehmann weighing up whether to play two spinners in a home Test for the first time in a decade as Lyon said he and O’Keefe would not disappoint if paired together. O’Keefe is a self-described pink-ball specialist having taken 18 wickets at an average of 18.22 in three day-night matches for NSW over the last three years, including match figures of 2-76 last month. As Cricinfo reports - Cricket's first ball under lights was bowled by Imran Khan to Rick McCosker on December 14, 1977. It was a practice match between the Australia and World XI teams of Kerry Packer's World Series Cricket, on a drop-in pitch at Waverley Park, a football stadium. Now in this Adelaide test, the pink ball certainly was a head-turner. But it's not just being pretty in pink that has made it the belle of the bat'n'ball. With the first ever day-night Test match starting at 2 pm local time, it was closer to our playing time at the morning 9 O clock – and it was a match played day-night in pink ball. The pink Kookaburra ball has its own Twitter account and even a nickname, with 'Galah' and 'Panther' two of the early contenders. Its celebrity status knew no bounds, as the ball and the inaugural day-night test were resounding winners on a cracking occasion at the Adelaide Oval on Friday. Even the previously sceptical players appeared sold after playing in front of a fizzing crowd of 47,441. "It played out exactly as we forecasted. It was great to be part of it, an exciting day, and an electric atmosphere out there. A few wickets tumbled and the game has well and truly progressed now. Definitely a pretty good first day," Black Caps swing bowler Trent Boult said. Twelve wickets fell on day one with Australia having the advantage at stumps at 54-2 in reply to New Zealand's below par 202. Although as Boult said, no-one really knows what a par total is against the pink ball, but New Zealand were disappointed with their batting effort when the ball did little in the air during daylight hours. Another interesting trivia, as reported in The Guardian – in 138 years of Test cricket, the first break has always been the lunch followed by the tea break but these breaks witness a ‘role reversal’ during the Test match. For a change, the break after the first session will be for tea with the duration being 20 minutes. It will happen at 4 pm local Adelaide time. The ‘Dinner’ break or may be rightfully called the ’Supper break’ will happen at 6:20 pm and will be of 40 minutes duration with the final session happening from 7 pm to 9pm fully under floodlight. Zaheer Abbas, the president of the International Cricket Council, hailed the concept of day-night Test matches days before Australia play New Zealand in the first-ever such match, adding thathe saw the idea as "thoroughly enlightened". "The sceptics and critics might call it a leap in the dark but I prefer to view the decision to play day-night Test cricket - a concept set to become reality when Australia plays New Zealand in Adelaide - as thoroughly enlightened," Abbas wrote in his column for the ICC website. The Hindu reports that India’s only day-night first-class match was the Ranji Trophy final between Mumbai and Delhi played with white ball at the Roop Singh Stadium in Gwalior from April 5-9, 1997. For the record, Mumbai won the Ranji Trophy by virtue of first innings lead. The BCCI did not try day night first class matches after that. Indian win at Nagpur ! McCullum loses toss at Perth ... and 'no toss' from now ? After losing the toss in the second test against Australia in Perth Black Caps' captain Brendon McCullum took his record at the toss in test cricket to won 10, lost 16, but is the Kiwi captain really that unlucky? Superstitious Black Caps fans concerned there might be a curse on the skipper can rest easy. Despite his unfavourable record in tests, McCullum's record in all formats of international cricket is actually pretty close to 50-50. When a coin is tossed up, there are only two possible outcomes – it can be Head or a Tail [crooked possibility of coin standing up removed] - the possibility of somebody determining the outcome, scientifically, is not probable – yet when it occurs in sequence by chance, some Captains are touted as intelligent when calling them ‘lucky’ would have been more appropriate. When we toss up, there can be a head or a tail – so the possibility of your calling it right is 50% ? - if that logic were to be correct, then you should be calling right one out of 2 – that does not happen – some Captains lose tosses in row. That takes us to the ‘probability theory’ - Probabilities are written as numbers between zero and one. A probability of one means that the event is certain. If you toss a coin, it will come up a head or a tail. So there is a probability of one that either of these will happen. A probability of zero means that an event is impossible. If you toss a coin, you cannot get both a head and a tail at the same time, so this has zero probability. Anything that can happen but is not certain is written as a number less than one. In 1979 when Pak toured India and when Asif Iqbal was the captain – in the last test at Calcutta, there were allegations that Asif told the Indian captain Gundapa Vishwanath that he had won the toss and mildmannered Vishy lacked the gumption to contest him and accepted his words !!! ~ again in 2011, in that World Cup finals with Ravi Shastri as commentator; match referee Jeff Crowe, Dhoni tossed the coin and Ravi Shastri started querying Dhoni on what he intends doing. It was clear to most that Sanga had called tails and lost it but Sanga claimed otherwise and Jeff Crowe said ‘he had not heard it in the din’. .. … and there was re-toss !!! If not others, Sangakkara certainly knew what it really was ! At Nagpur, India won the Series by 124 runs. Ravi Ashwin waltzed away to his fourth 10-wicket match haul, Amit Mishra - like he did in Mohali - broke the big partnership by getting Amla and then took du Plessis out in the last exchanges before tea. The resumption of the chase was stillborn when Ashwin took out Dean Elgar and AB de Villiers in the first 10 overs of the day. Surprisingly, Ravindra Jadeja went wicketless in 25 overs, but it wasn't as if he didn't look like getting one. A lethal cocktail of an underprepared pitch and their own recent regression as a tough-nut outfit in Test cricket explains South Africa’s seemingly imminent fall from grace in India. The wheel spun full circle on a violent day two of the third Test match on Thursday, with 20 wickets tumbling and SA succumbing to meagre 79. An era ended today when SA predictably succumbed by 124 runs in the third Test, ensuring series defeat – their first in 16 away ones since 2006. This time they batted a good bit longer (89.5 overs) than any of the three prior ones had lasted. A total of 185 may not look too flash on paper, but that is on a Test where Murali Vijay’s 40 remained the highest score. English cricket will feature a major change to the tradition of the pre-match coin toss to decide which team bats first in 2016, the England and Wales Cricket Board announced on Thursday. In both tiers of next season's County Championship, the visiting captain will be given the option of bowling first which, if he chooses to take, will see the toss rendered unnecessary. 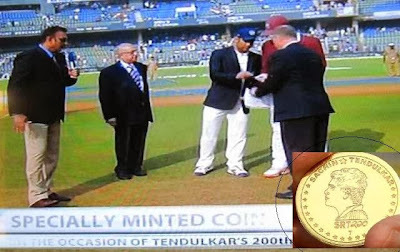 A coin will only be spun, as has been cricket's tradition for over a hundred years, if the visiting captain rejects the chance to bowl first. The proposal was passed, on the basis of a one-year trial, at an ECB board meeting at Lord's on Thursday and cricket committee head Peter Wright said the move came about partly as a result of concerns about the development of English spinners. Rather than home teams now winning the toss and unleashing a seam-heavy attack on a pitch which makes batting hazardous, the away captain will now have the option to intervene. So an altogether new probability in the ‘toss’ – which perhaps You and I never thought, would happen !! famous food chain refuses cup of tea ~ for it was bought for a homeless woman ! Bolton, is a town in Greater Manchester in North West England. A former mill town, Bolton has been a production centre for textiles since Flemish weavers settled in the area in the 14th century, introducing a wool and cotton-weaving tradition. Bolton was a 19thcentury boomtown, and at its zenith in 1929 its 216 cotton mills and 26 bleaching and dyeing works made it one of the largest and most productive centres of cotton spinning in the world. The British cotton industry declined sharply after the First World War, and by the 1980s cotton manufacture had virtually ceased in Bolton. Often, when you enter a hotel or a restaurant, you notice a sign stating that the right to admission and service to every guest rests with the hotel. However, the foundation of the hospitality industry remains the service that is provided to every guest who walks into the hotel or the restaurant. Though it is a service industry, it involves transaction between two parties and one of them has the right to decide on the presence of whom they want [rather whom they do not want] says sources. Every hotel has its own set of codes of conduct that the guests need to adhere to. These might range from the appropriate attire of the guests to their behaviour. Some do deny admission to guests not wearing shoes. MCC and another famous club were in news earlier for denying admission on dress code. McDonald's Corporation is the world's largest chain of hamburger fast food restaurants, serving around 68 million customers daily in 119 countries. Headquartered in the United States, the company began in 1940 as a barbecue restaurant operated by Richard and Maurice McDonald. A McDonald's restaurant is operated by either a franchisee, an affiliate, or the actual corporation itself. Some time back was an outrageous incident of pushing out a child in its Pune outlet. Facebook and other media were ripe with reports that a child was literally pushed out by the employees as it stood in a line along with a woman when the child came to buy a drink. The woman incidentally seeing the child on the street offered to buy him a softdrink; the boy was pushed out, though the woman contended that she had brought him in. The FB news circulating stated the employee as stating “such people are not allowed in the restaurant” and adds that the woman purchased a drink and gave it to the child outside. She uploaded a picture of the child and the bill item on her Facebook account. 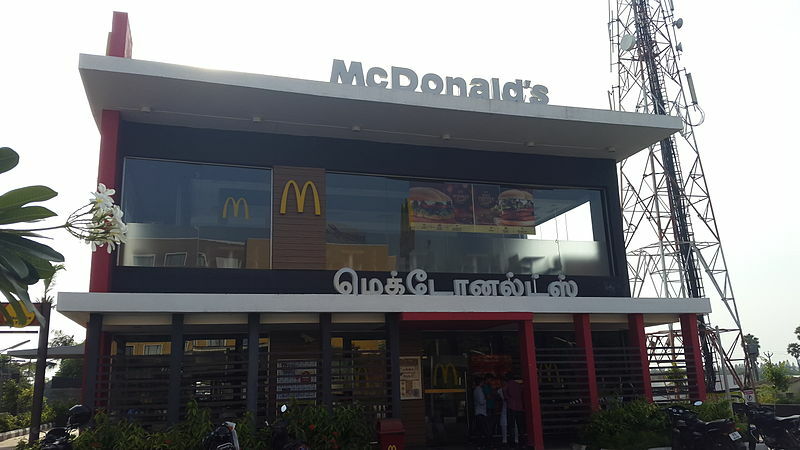 After being roundly criticised for its actions and blatant discrimination, McDonalds India said that appropriate action would be taken in case of any act of breach. To them destitute street children are strictly ‘no’ even if somebody else is prepared to spend on them ! – people were asking - "What was the problem in Pune? No one asked for a free meal. The lady who took the child in was going to pay for the food. So why did McDonald's evict the child ?" Now there is another storm in a tea cup !! MailOnline reports that a man was outraged with McDonald's after claiming they refused to serve him a cup of tea - because he was buying it for a homeless woman. Anil Barber, 38, took pity on the shivering lady after seeing her hunched up inside the fast food restaurant in Bolton in the early hours of the morning. He is reported as saying that staff at the counter told him he wasn't allowed to buy the beverage because the woman was homeless, and it would encourage her to beg. Strange are the ways of people !! Nagpur Test - no turns - only spin - SA all out for 79 ! Do you know Amar Karlekar ? Vidarbha is the eastern region of Maharashtra, comprising Nagpur Division and Amravati Division. Its former name is Berar (Varhad in Marathi). Situated in central India, Vidarbha has its own rich cultural and historical background distinct from rest of Maharashtra. The largest city in Vidarbha is Nagpur, the second largest is Amravati while Akola stands third followed by fourth largest city Chandrapur. After day 2 the Nagpur test is poised for a finish and it is easy to blame the pitch as underprepared – this is not the first time – most countries tailor wickets to suit them – yet the slump of South Africa who scored only 79, their lowest score since readmission, is the result of more than just a snake pit of a surface and shrewd spinners for opponents. 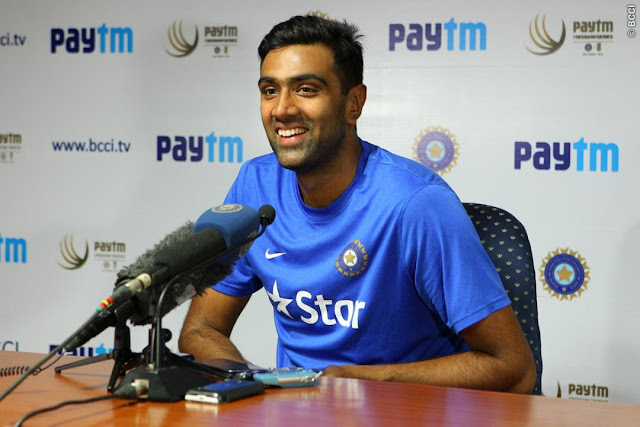 Ravichandran Ashwin is on a roll – today he had magical figures of 16.1-6-32-5 - SA all out in 33.1 overs – and yes, Ashwin has bowled right through the innings from one end. In test no. 2175 in Aug 2015 at Trent Bridge, Nottingham, Stuart Broad seamed the ball off a green pitch and rans through Australia, who were bowled out for 60. Their innings lasted only 18.3 overs. Russell Domingo, South Africa's coach, refused to criticise the Nagpur pitch - and gave credit to India's spinners for bowling with far more control than those from his side - but seemed to hint at the loss of those vast possibilities while describing how difficult batting had been, for both sides, during this series. 82 was the previous lowest total by a team against India in Tests - Sri Lanka in Chandigarh in 1990-91. Now South Africa have been bowled out for 79 in Nagpur. It was South Africa's lowest total since their return to Test cricket in 1992. Their previous lowest had also come against India, in Johannesburg in 2006, when they were dismissed for 84. In Test 3 – score card reads South Africa 79 (Ashwin 5-32, Jadeja 4-33) and 32 for 2 need another 278 to beat India 215 (Vijay 40, Harmer 4-78, Morkel 3-35) and 173 (Dhawan 39, Tahir 5-38) – yes no batman has so far made a 50 – Murali Vijay’s 40 in first innings has thus far been the highest !! Way back in Test no. 47 in Feb 1896, SA were bowled out for 30. GA Lohmann had figures of 9.4-5-7-8. Again in Test no. 153 in June 1924 at Edgbaston, when England won by an innings and 18 runs - SA made a mere 30. AER Gilligan had 6 for 7 and MW Tate had 4 for 12. In Cricket (read as Test Cricket) – towards the close of the play i.e., in the dusk when you have only a few overs left – at the fall of the wicket, to protect the higher order batsman – a lower order batsman would come padded up …….towards the close of play, their directive is to play out the couple of overs and frustrate the bowlers further the next morning……. It is protecting the wicket in the night and hence called ‘nightwatchman’ in Cricket. In theory, no team would like to lose two top quality batsman in quick succession, when lights are falling and when the day’s end is closer……. Remember that way back in 1978, Kapil Dev was sent out as a night watchman – hit a towering six and when he got back at the close of play, the captain Bishan Bedi chided him for doing what he did – scoring runs – hitting a six !!! ~ so theoretically, nightwatchman is expected to defensively bat it out and not try to score runs – ruling out any risks !!! Jason Neil Gillespie played for Ahmedabad Rockets in ICL… had in Test No. 1799 at Chittagong stadium in April 2006 – walked in as a nightwatchman at 120/2 – scored unbeaten at 201, taking the total to 581/4.... he thus has the unique distinction of the first (and only one thus far) nightwatchman to score a double-century. His figures of 3/11 & 0/14 with that double ton won him the Man of the match as also the Player of the Series….after that series he went in to oblivion and never played for Australia again is the irony !!! In both the innings, ImranTahir was sent in as nightwatchman – in the 1st he got out to Sir Jadeja for 4 and today he made 8 – got out to Amit Mishra. Amar Karlekar, is the Vidarbha Cricket Association curator. He had said a day earlier to the match that the pitch in Nagpur will not vary much from the turning track in Mohali. The curator told that the Ranji match between Vidarbha and Assam was played on the same pitch in order to test it. The nature of the pitch became quite noticeable when the Vidarbha spinners grabbed 16 wickets in total to give the hosts a win. An intolerant India ? 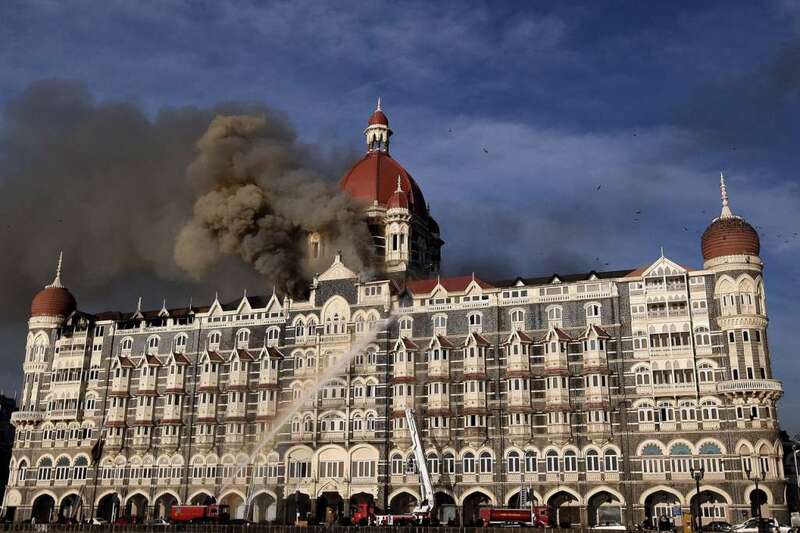 – this day Nation can never forget 26/11 when it was under siege by militants from across the border. How many felt sorrowed and protested for that ?? On 21st Nov 2012, - Ajmal Kasab, the living face of Mumbai terror was hanged, almost 4 years after that incident that shocked India and entire World. The Nation can never forget that dreaded day in 2008 when Kasab and nine Pakistani gunmen launched a bloody attack on multiple locations in south Mumbai. Kasab and another gunman attacked Chhatrapati Shivaji Terminus in south Mumbai shooting train commuters. Over 50 persons were killed and over 100 injured. They then killed the state anti-terror squad chief and two other senior police officers near Cama Hospital. In this great Nation of ours, even the killer was given a fair trial – the entire legal process unfolded with Kasab being served food and he asking for Urudu papers and more. India took the trouble to conduct and ensure, that it believed in a proper justice system and would deal with attacks against its people according to the law. There were so many victims whose pathetic cases were buried deep – and that was not restricted to humans. At Mumbai, Sheru, a stray dog who took terrorists' bullets at CST during the 2611 attack died of a cardiac arrest after surviving a few years. Today is a (sad) day to remember – it is 26/11. On that fateful night, fishermen at Mumbai’s Machhimaar Colony saw ten young men with large rucksack disembark from an inflatable Zodiac speedboat. An hour later, armed with hand grenades and automatic rifles, they created terror across the city, held the city and thereby the Nation itself to ransom. It was indeed India’s time of shame and pain. Before midnight, over a ton of people including some Top Police cops were dead. It took nearly 3 days for semblance of total control. Its perpetrators or executants including the lone arrested Ajmal Kasab is no more – but those schemers are still large and the pain remains !. The horrific memories of the night when the terrorists hijacked the police vehicle and killed top cops and then went on shooting innocents haunts people. Comics are an integral part of every child’s growth – in our days we had the Ambulimama (chandamama) / Amar chitra katha. Today’s kid are obsessed with Jetix of Walt Disney. The illustrious Bhaskar Kadam, Hemant Bawdhankar, Sanjay Govilkar, Tukaram Omble, Hemant Karkare, Ashok Kamte , Vijay Salaskar, Shashank Shinde, Major Sandeep Unnikrishnan, Hawaldar Gajendra Singh – and the like should be the heroes whom the Nation must be reading and knowing. There were so many unsung heroes too – for example the Fire Service of Mumbai whose personnel did not flinch once as they grabbed their gear and rushed to douse fire amid an intense gun battle. 1. Make sure you are covered well by insurance. Even if you are well off - leave them better off if the unfortunate were to happen. 2. Let them know details on things like bank accounts, investments etc. Keep a folio with your spouse and close family. 3. Use every waking moment to cherish what you have - family, friends, nature. Stay smiling, laughing and caring. Post 26/11 terror attacks, Mumbai police carried out number of corrective steps. However, there are still gaps that need to be filled to make the city safe and secure. DNA reports that according to former top cops, with changing time terror organisations around the world are becoming more and more tech savvy and are improvising on their plans to create mayhem across the globe. "One cannot say that Mumbai police can ever be fully prepared to tackle such kind of attack as with changing times even the terror outfits are adapting to new technologies but considering our capability in 2008, I believe we are in much better position to respond now,"
The prosecution, in the year 2013 had filed 22 charges against him, under various sections, that was accepted by the Special Court. Sayed Zabiuddin Ansari alias Abu Jundal, the mastermind behind the 2008 Mumbai terror attacks, is behind bars since 2012 facing trial for his role in organising the attack. Jundal was arrested by the Intelligence Bureau that handed over him to Delhi police, who later handed him over to the Mumbai police. After his arrest in October 2012, he had confessed to his crime, that he was the one who had given training to the attackers on how to enter India as well as the sites to target. The confession was recorded by the metropolitan magistrate court presided over by judge PS Rathod. Later, when he was sent to judicial custody, he claimed that he had not given any confessions and that he was just asked to sign on a blank paper. Meanwhile, after the charges were framed against Jundal, the prosecution pleaded the court to add the name of the US national David Headley as an accused in the case. Headley was a member of the LeT, a terrorist organization, and had played an active role in criminal conspiracy behind the 26/11 terror attacks. The court in October 2015, allowed the prosecution's plea and made Headley an accused in the case. It has asked the accused to be present before the court, via video conferencing on December 10. So the cases are alive, not for those many who lost their lives and their dear ones – to whom it is only sorrow. Sad day it was for the Nation ~ yet, India has been tolerant ! It has been raining and news on rain is almost no news – one may not be following Ranji – Tamilnadu is to play Gujarat in Group B – at Tirunelveli, which too is likely to be a wash out. Meantime, in Group A, Bengal moved to top in Group A – having won only 2 matches of their 7 though. After grey, blustery and mostly cricket-free Bangalore, where SA struggled again, the Test now shifts to the geometric centre of India and the promise of a Test match free of interruptions under clear, cloudless skies. India ended day one of the second Test in a position of great cricketing and psychological strength, but there has been no action in the ten days since. India is on a strong 1-0 up – and for sure it is going to be another spinner-friendly track. Getting back to that West Bengal match – it was played at Kalyani, a city and a municipality in West Bengal, located around 50 kilometres (31 mi) from Kolkata. Situated on the banks of Hooghly River, the city is spread over an area of 29.14 square kilometres (11.25 sq mi). Interestingly, Kalyani was site of an American Airbase, known by the name of Roosevelt Town or Roosevelt Nagar during WW II.] It was developed as a planned town in early 1950s by the Government of West Bengal on behest of Bidhan Chandra Roy - the second Chief Minister of West Bengal for hosting the Indian National Congress meeting and to accommodate the housing needs of the growing population of Calcutta. Kalyani has a dedicated industrial zone having numerous industries including Andrew Yule and Company, Kalyani Breweries ( UB Group), and Dabur; though many of the industries have closed or stopped production. Ashok Bhimchandra Dinda has played 13 ODIs and 9 T20s taking 12 and 17 wickets thus far. This 37, however is not the lowest – In Nov. 2010, on the first morning of the 77th Ranji Trophy, Rajasthan bowled Hyderabad out for 21 in 78 minutes of mayhem in Jaipur, breaking the tournament record for the lowest team total and equalling the Indian first-class record. Debutant Deepak Chahar, Rajasthan's 18-year-old medium-pacer, did the damage with a spell that read 7.3-2-10-8. The previous lowest was in 1934-35, when Southern Punjab were bowled out for 22 chasing 114 against Northern India in Amritsar. Mohammad Hafeez, the Pakistan batsman, has said he will not share a dressing room with any player who has tarnished the image of Pakistan cricket. His declaration comes after an Urdu newspaper, Jang, reported that Hafeez had turned down a lucrative offer from Bangladesh Premier League franchise Chittagong Vikings to play in BPL 2015-16, because Chittagong have Mohammad Amir in their squad. "I am not against any individuals," Hafeez told ESPNcricinfo. "It is about the image of Pakistan cricket. I cannot play with any player who has tarnished and brought a bad name to the country. But, yes, if any other team offered me the contract with good money I could definitely play the BPL. Otherwise I prefer playing for my domestic team, SNGPL, in Quaid-e-Azam trophy at home. As I opened my homepage today – this Google doodle greeted me – and I thought it something related to Darwin and his theory of evolution. Charles Robert Darwin, [1809 – 1882) was an English naturalist and geologist, best known for his contributions to evolutionary theory. He established that all species of life have descended over time from common ancestors, and in a joint publication with Alfred Russel Wallace introduced his scientific theory that this branching pattern of evolution resulted from a process that he called natural selection, in which the struggle for existence has a similar effect to the artificial selection involved in selective breeding. Darwin published his theory of evolution with compelling evidence in his 1859 book On the Origin of Species, overcoming scientific rejection of earlier concepts of transmutation of species. But this is no Darwin’s……. but - Lucy the Australopithecus - and Google is celebrating the 41st anniversary of the discovery of a pile of bones by paleoanthropologists working in Ethiopia ! Confusing !! – the pile of bones belonged to a skeleton that would shine some light on the way in which our species evolved from tree dwelling apes to the tall statured and intelligent human beings we are today. 41 years ago, a team of archaeologists working in Ethiopia discovered the remnants of an ancient skeleton that became a vital missing piece in the puzzle of how humans came to be. Nicknamed "Lucy", the skeleton was dated at 3.2 million years old - the oldest known example of a bipedal primate and a crucial stepping stone between apes and homo sapiens. Nowadays, Lucy's bones are kept in a museum in Ethiopia, although they spent six years touring the US from 2008 to 2013. Barack Obama visited the fossil on a trip to Africa earlier this year, and was permitted to touch it, something usually reserved for scientists. The Afar Triangle (also called the Afar Depression) is a geological depression caused by the Afar Triple Junction, which is part of the Great Rift Valley in East Africa. The region has disclosed fossil specimens of the very earliest hominins, that is, the earliest of the human clade; and it is thought by some paleontologists to be the cradle of the evolution of humans; and it is here - Lucy is the common name of AL 288-1, several hundred pieces of bone fossils representing 40 percent of the skeleton of a female of the hominin species Australopithecus afarensis was found. Lucy was discovered in 1974 near the village Hadar in the Awash Valley of the Afar Triangle in Ethiopia by paleoanthropologist Donald Johanson. Usually, for the arduous practice of paleoanthropology in the field, only few fossils and fragments of fossils are collected, and only rarely are skulls or ribs uncovered intact. But the Lucy "find" was extraordinary for the large fraction of the skeleton recovered and the significant amount of new information it provided, and for its age. "Lucy" acquired her name from the song "Lucy in the Sky with Diamonds" by the Beatles, which was played loudly and repeatedly in the expedition camp all evening after the excavation team's first day of work on the recovery site. After public announcement of the discovery, Lucy captured much public interest, becoming almost a household name at the time. Beginning in 2007, the fossil assembly and associated artifacts were exhibited publicly in an extended six-year tour of the United States; the exhibition was called Lucy’s Legacy: The Hidden Treasures of Ethiopia. Lucy became famous in the US and around the world, and was returned to Ethiopia in 2013. Today on 24th November 2015, Google honoured the 41st anniversary of the discovery with a Google Doodle on their homepage. Although Lucy had many of the characteristics of chimpanzees, such as long arms and a protruding belly, the skeleton showed that she primarily walked upright, the earliest example of such a primate. Bipedalism is seen as one of the key distinctions between the Homo genus and Pan, the family of chimpanzee species. Before her discovery, scientists had speculated that bipedalism came alongside the development of larger brains, but Lucy's was barely larger than those of chimpanzees. Scientists believe Lucy was 3.7 feet tall and 29 kgs in weight. Although she walked upright, she was quite small in size compared to humans. Her skeletal remains are now kept in a National Museum in Ethiopia’s Addis Ababa and her plastic replica is kept in the public for tourists to observe. Cargo Packing ~ how 24 pc dinner set was delivered by Tesco ! Marine Cargo Insurance offers protection for goods that are being moved from place to place. There is the Consignor, Consignee and the transporter – the mode through which the transportation takes place. For a Cargo Insurer, the subject matter of insurance, the origin and destination involved, and the way the goods are packed are all of significance. Goods are packed [and that includes no packing !] – when there is movement of goods, the primary aspect is of packing is to enable them transportable. Though there are various functions of packaging – it can broadly be classified as : Primary, secondary and tertiary. From transportation perspective, the ease of handling and lesser the volume it would occupy are important. From an insurance perspective, the protective function is of utmost importance i.e., Packaging must protect the goods from loss, damage and theft and should be convenient to handle. Often when information is sought, the answer could be : Standard and customary. English definition of Customary : - Customary is used to describe things that people usually do in a particular society or in particular circumstances; 0r what is generally used by the industry as a practice. In our day to day life, we come across so many packing types – simple one is the ‘rice in bags’, the conventional ones. As you could easily discern, they are conventionally standardized ones – i.e., 50 kg bags when bought in rice market and in small quantities of 5/10/15/20 kgs for invidiuals. When rice and other similar products are to be transported to far off places, that too in huge quantities, they are loaded in containers or simply sent in bulk. Getting back to packing, the protective function essentially involves protecting the contents from the environment, hazards they are exposed during the transit. The inward protective function is intended to ensure full retention of the utility value of the packaged goods. In addition, packaging must also reliably be able to withstand the many different static and dynamic forces to which it is subjected during transport, handling and storage operations. The goods frequently also require protection from climatic conditions, such as temperature, humidity, precipitation and solar radiation, which may require "inward packaging measures" in addition to any "outward packaging measures". Packing is an important exculpatory exclusion in Institute Cargo Clauses  which reads : Loss, damage or expense caused by insufficiency or unsuitability of packing or preperation of the subject matter insured (for the purpose of this Clause 4.3, packing shall be deemed to include stowage in a container or lift van but only when such stowage is carried out prior to attachment of this insurance or by the insured or their servants). So the packing must be sufficient. Sufficient packing is normal or customary packing in the trade. Such packing should permit the goods to withstand the normal hazards likely to be encountered on the specific voyage contemplated and to prevent all but the most minor damage under normal conditions of care and carriage. There of course cannot be an all encompassing single criterion determining ‘insufficiency of packing’. 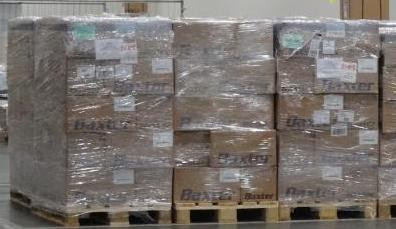 While protective packing is required for withstanding normal hazards of transit – the goods have to remain saleable and the Promotional packing would attract the buyers enabling faster sale. If one were to seek Marine insurance for ‘dinner set’ – the Marine Insurer might think that this is a fragile item, prone to breakage and hence packing is very important. If you are a Marine Insurer, how would you respond to a proposal of 24 piece dinner set ordered from Tesco, coming as they did with every single item packaged in two individual boxes – individual packing for every piece, that too, two boxes – excellent one might scream – not Joanne and Billy Murphy, from Ashton-under-Lyne in Greater Manchester, who ordered this a 24-piece dinner set from Tesco. They were stunned when it arrived after 14 days and every single item had been packaged in two individual boxes ! Once all the pieces had been unwrapped from the £50 delivery they could not see the floor of their living room. MailOnline reports that Joanne and Billy Murphy were mystified as to why every plate, bowl and mug they had ordered from Tesco was packed in its own individual box and then placed inside a second bigger box. The pile of boxes took up so much space the family could not see their living room floor once they had unwrapped all the items from the 24-piece dinner set ~ and despite the careful packing, four bowls and a mug were smashed in the delivery. 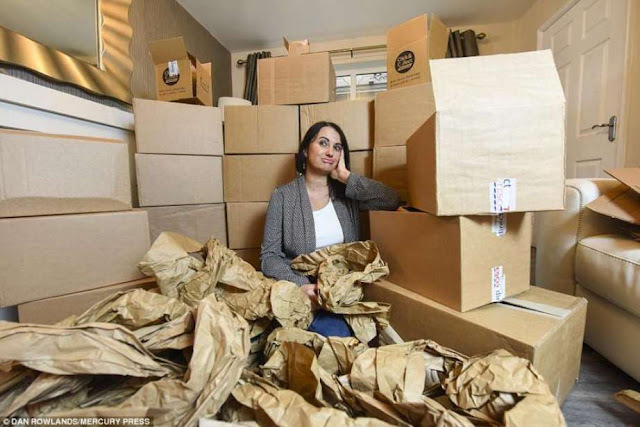 Mrs Murphy, 39, a mother-of-two, thought the delivery process was 'ridiculous and 'laughable' as everything was double boxed; and was annoyed Tesco had initially ignored her requests to help her clear away the piles of cardboard. She was already irritated at having to wait 14 days for the £50 delivery to arrive. She said: 'The ironic thing is despite all the packaging, they still managed to break five items. 'The first two bowls came in a separate delivery. I thought it was pretty bad they came in their own boxes so I rang Tesco to complain. 'I thought that would be a one-off. I never expected the whole order to be like that. 'The driver knocked on our door and asked if I was expecting a big delivery. I said not really, just some kitchen stuff, but his entire van was full of it. 'He was astonished as we were. Nobody could understand why there were so many boxes. 'Every plate, bowl and mug came in two boxes. It was laughable. 'I think it's ridiculous and I was even more annoyed when they ignored me after I asked them to come and clear it up. 'After everything was unwrapped we couldn't even see the floor.' Mrs Murphy and husband Billy, 38, a railway engineer, pay £6 a month as part of the Tesco Delivery Saver as they regularly use the company for their grocery shopping. When the couple finally opened the boxes there was also a huge amount of paper inside which added to the clutter. She rang Tesco to complain but the store initially only wanted to deal with the broken items. They have now collected the packaging. The full-time mother, who lives in Ashton-under-Lyne in Greater Manchester, said she had concerns about the environment impact of the cardboard overload but could also see the funny side. 'For the kids it was like Christmas Day. They were making dens and turned some of the boxes into an indoor skate park', she said. Tesco, which used delivery firm Yodel to distribute Mrs Murphy's order, said the amount of packaging was a blunder. A spokesman told MailOnline: 'We aim to use the minimum packaging possible while ensuring our products are properly protected from damage. Clearly we’ve made a mistake on this occasion. 'We have apologised to Mrs Murphy, will replace the damaged items and have collected the excess packaging from her house so it can be recycled'.